There’s nothing like the smell of freshly baked bread wafting through the house to create a warm and fuzzy feeling. Perhaps the only thing that beats it is that first bite of a slice of hot, freshly baked bread, crunchy on the outside, soft and steaming still on the inside, drizzled in some extra virgin olive oil. Marco, my husband, is the baker in the house. Tuscans don’t know how to live without bread. If there’s no bread on the table the meal is not complete, so to make sure there’s always bread in the house he bakes his own. He makes his own piadina every morning for breakfast (yes, breakfast piadine! mmmm…) and prepares dough for filoncini (a baguette type loaf) or panini rolls before going to bed, leaving it all night to rise. 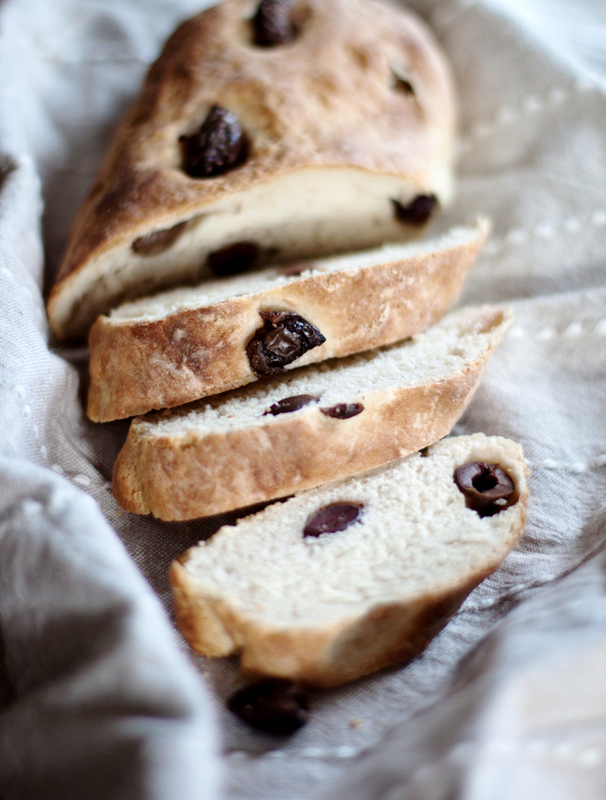 Lately, he’s been throwing black olives into the dough for pane alle olive, a delicious soft white bread where the olives seep a characteristically salty flavour into the dough. It’s a traditional bread from the southern tip of Puglia. A place where olive trees grow like nothing I’ve ever seen before – huge, twisted, gargantuan versions of the light, shimmery olive trees you see in Liguria or Tuscany. 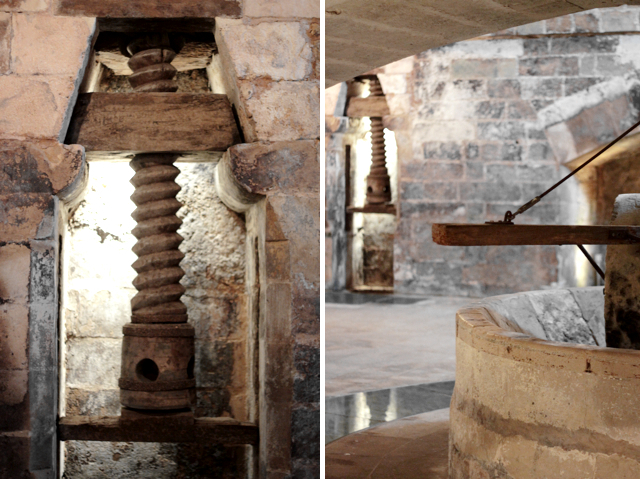 It’s a place where underground olive oil mills were built like subterranean cathedrals to escape the intense heat and where food is not to be taken lightly (both figuratively and physically). It’s also a place where arguably the best-tasting bread in Italy is made, so it’s only natural that two of the region’s top products come together as one. 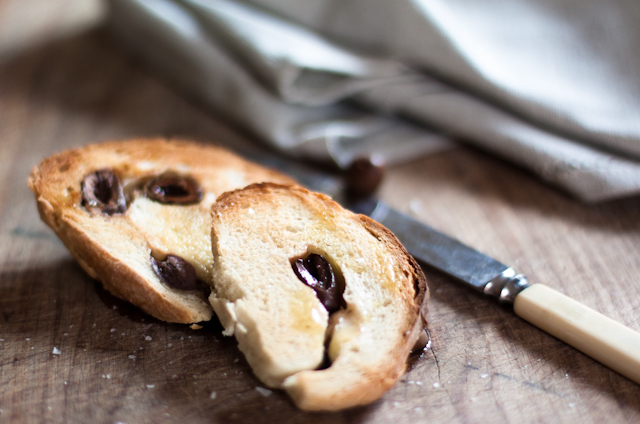 Pane alle olive, particularly when it’s homemade, comes in all shapes and sizes. You can find small, flat focaccia rounds studded with green or black olives, or long loaves so full of olives that they outweigh the dough. The little ones make a really nice snack when you just need something to tide you over. Use the tastiest table olives you can find, black or green, wrinkled or smooth – just do not use the ones in a can of brine, already deseeded, that taste like plastic and not much else. Greek Kalamata olives and Ligurian Taggiasche olives (my personal favourite) are good examples of tasty table olives – salty, meaty and slightly sharp. You only need a handful of olives here you can deseed them yourself in a flash – just use the flat side of a large kitchen knife to squash the olives and pull the seeds out easily. Mix the yeast with a little bit of the flour and some of the water to activate the yeast (if it’s dry) or see if it’s still good (if fresh). When you see bubbles appear in the mixture, add the yeast to the rest of the flour and water a little bit at a time until it comes into a dough. Add the salt and olive oil. Knead for about ten minutes then set the dough in a large bowl. Cover it with plastic wrap and let it rise in a warm place away from draughts for at least one hour. Add the olives, mix through the dough and form into the desired shape (rolls, loaf or filoncino for example). Bake in a hot oven (200°C) for about 20 minutes if you are baking small rolls or filoncini, until golden brown. Oh, I adore olive bread. I haven’t made it myself yet, but I buy it all the time from our Whole Foods store 5 min. away. Your photos are just exquisite! A delicious bread! I love olives. Beautiful bread! You’re very lucky to have a husband like yours who makes the bread by himself! It’s an easy recipe. I’m not a big bread maker but I’ll give this a try. I am lucky, aren’t I? Do try it, I’m sure you’ll put some of your characteristic twists on it, I’d love to hear how it goes! 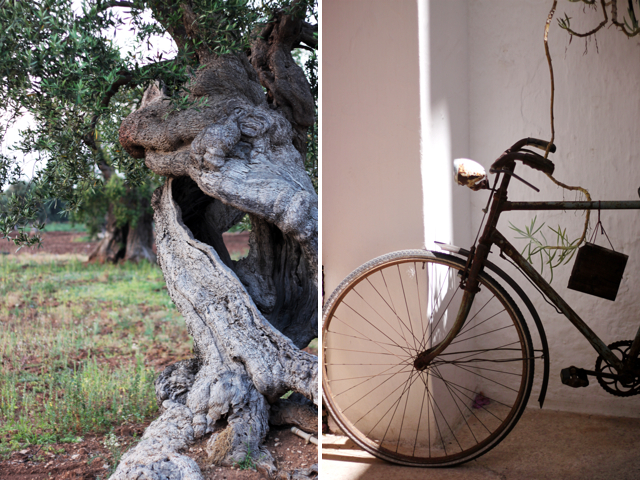 Your photos remind me of the first study trip I did with the Masters, to Puglia. We visited old underground olive mills, centenary olive tree orchards, natural parks, and ate the best food of our young life. Unforgettable. It is truly an unforgettable place, isn’t it? I love it, can’t wait to get back there again – will just need to fast for at least a week before going so I can fit in all that amazing food! The bread looks divine and I so enjoyed the photographs of the olive tree and press. A year ago I decided never to buy another supermarket loaf again, and since then have adopted the ritual of baking bread at home every other day. It’s such a pleasure to feel the dough in my hands and enjoy hot bread straight from the oven. Lovely post! Wow, that’s an impressive commitment! Amazing. We’re not at that stage yet and still buy some bread; getting make it at home is more of a treat I guess – just like you said, it’s all in the pleasure of making it! Beautifully written and photographed, as always, Emiko. I haven’t made bread for a while as I’m lucky to be able to get really good artisan bread in London, but you’ve inspired me. Love your website. it is simply great! You two would be proud of me, I’ve just started my bread baker career at home, and I am already in love with the process and the smell! the smell! and the taste.. the taste! Love this olive bread loaf, I can just imagine how good it is just out of the oven! That bread sounds fantastic. I love the saltiness of olives in bread. It’s the saltiness that I love in this bread too! So good with just a drizzle of olive oil! 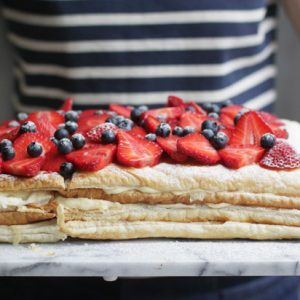 Thank you-I am going to make this tomorrow! As usual your photos are wonderful. 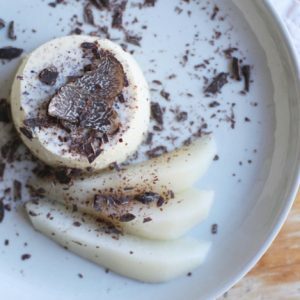 An inspiring post both in terms of cookery and photography. I can imagine the smell and taste of your bread. Beautiful! Italian bread is so delicious, but I find that often the Tuscans don’t salt theirs. I noticed that your husband’s recipe has salt – is that something he’s always done, or is it a slightly more modern addition? Yes, Tuscan bread is unsalted, it’s the defining characteristic of the Tuscan table, if you ask me – that unsalted bread! It accounts for why everything else that you eat with the bread is so salty and tasty. 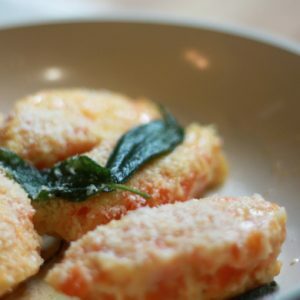 This recipe though is based on a bread typical of Puglia, in the south, where the bread is so delicious (and salted). In fact, when you go into a Tuscan bakery, you can ask for ‘pane toscano’ (Tuscan bread, the unsalted one) or ‘pane salato’ (also known as ‘pane pugliese’, salted bread or bread from Puglia)! Yes, when we used to go on holiday when I was little I always asked my mum to buy the pane salato! 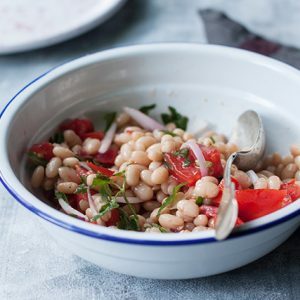 Now I rather like the chewy unsalted bread to mop up all those lovely salty flavours – or leave to go stale and make into pappa al pomodoro or panzanella. There’s nothing else like it, is there? This bread looks so delicious, wish Bruno baked bread! Pane alle olive is just wonderful! And you’re right, the smell of freshly baked bread is one of the most comforting smells there can be…in fact did you know that estate agents often bake bread on purpose before showing the house to potential buyers to create a comfy and home atmosphere?